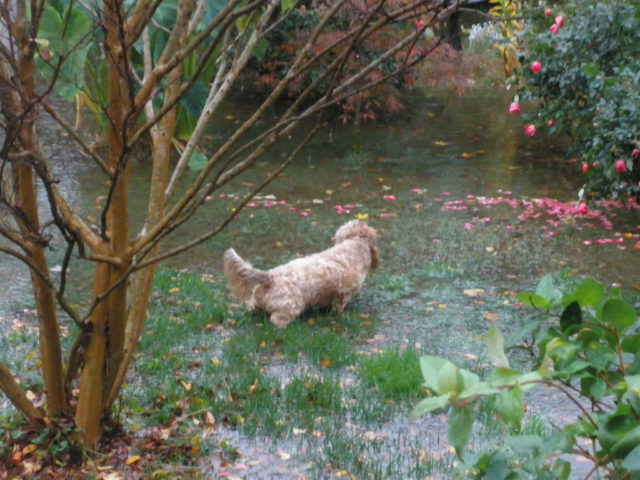 Training your dog to pee or poop on command could be the difference between standing in the rain forever or getting in out of the rain quickly. It will take a little bit of time for your dog to associate the behavior that you’re after, but the end result will be worth it! When it’s raining (or snowing) outside and you don’t want your dog (or you!) to get too wet or cold. If your dog is still having issues going potty inside your house. When you’re in a hurry and only have a little bit of time to get your dog outside to do his business. When training your dog to pee or poo on command, you need to have your dog on a leash each time he goes outside (just until he learns to go on command). Also, make sure you have some of your dog’s favorite treats in your pocket. When your dog starts to sniff around looking for a place to poop, or if he starts circling, immediately use a cue word. A cue word can be anything you want to use that lets your dog know it’s time to go. Just remember not to use that cue word in your everyday conversation — because if your dog hears it said in everyday conversation, it will not be effective as a cue word that signals going pee or poop on command. Once your dog starts to go potty, stop saying the cue word. In fact, stop talking altogether! The reason? If you talk to your dog while he is going potty, he will most likely stop and concentrate on you instead of what he should be doing. At the same time, continue praising your dog and giving him treats. From that point forward, remember to only use that cue word when you truly want your dog to pee or poop on command. As you know from dog housebreaking 101, you need to establish lots of potty breaks, always supervise your dog, and confine your dog to a limited area. Training your dog to pee or poop on command will be yet another useful tool for housebreaking your dog.